A couple months ago I received an awesome cookbook by Shauna Sever called Marshmallow Madness to review and have been having a blast looking through all the recipes. She has a recipe for almost every kind of marshmallow you could think of. 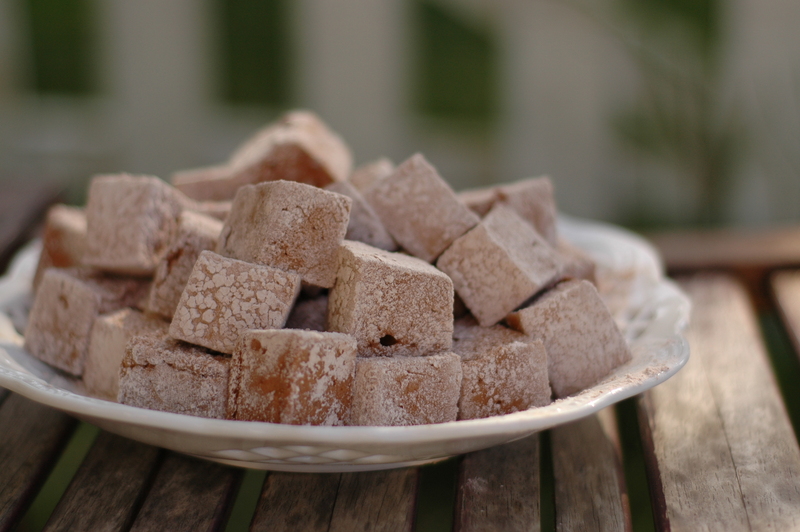 It took me two tries, but I figured it out and made some incredible chocolate marshmallows. My first attempt was a disaster. Granted, candy making is not easy and sugar work can be very difficult. Add in my inexperience around a stand mixer and you have lots of melted threads of sugar all over the kitchen floor. But, I have not been thwarted. The author made this whole process sound attainable and I knew it was probably my error. I reread the recipe and discovered that I should have used a smaller pot and I should have kept the mixer running when I added the hot sugar syrup. The second time around I corrected these mistakes and success! Watching the mallow puff up was quite magical. During the first five minutes I watched the mixer whip the chocolate and began to have my doubts that it would work, but then after I turned it up to med-high speed everything started happening. I am so happy I conquered marshmallows! Cooking them was a good mental exercise for my preggo brain. You have to pay close attention to the sugar as it boils and as you pour so you may want to make these when the kids are in bed or at school. I would hate to accidentally burn curious young bakers. I can’t wait to make more of the recipes in this book. I mean, who doesn’t want a Salted Caramel Swirl Marshmallow? Or how about a Key Lime Pie Marshmallow covered in ground graham crackers? Fabulous right? I think next time I might skip those fancy ones and go straight for the Strawberry Marshmallow made with fresh strawberry puree. Can you imagine what that must taste like? Probably amazing. I can’t wait to find out. 1. Gather and measure ingredients before starting. Lightly coat a 8×8 inch cake pan with cooking spray. 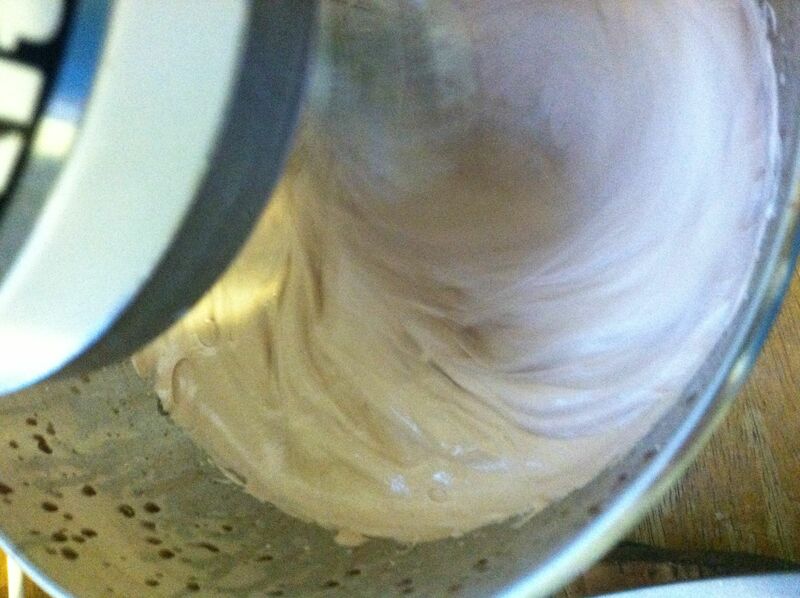 Make the sugar coating by mixing all sugar coating ingredients together, sifting if necessary. Set aside. 2. Make the Bloom: Whisk together the water and gelatin in a small microwave safe bowl and set aside to bloom for 5-10 minutes. 3. Make the chocolate syrup: In the bowl of an electric mixer, whisk together the cocoa powder, espresso powder and hot water until smooth. Pour in corn syrup and whisk until well blended. 4. Make the sugar syrup: Stir together the sugar, remaining corn syrup, water and salt in a medium saucepan over high heat. Clip a candy thermometer to the side of the pot and have it submerged in the sugar mixture but not touching the bottom of the pan. Boil stirring occasionally until it reaches 248-250 degrees F. Meanwhile, microwave the gelatin mixture for 30 seconds or until completely dissolved. Pour into the chocolate syrup and set your mixer on low (#2 on my KitchenAid). Let it run while you attend to the sugar syrup. 5. 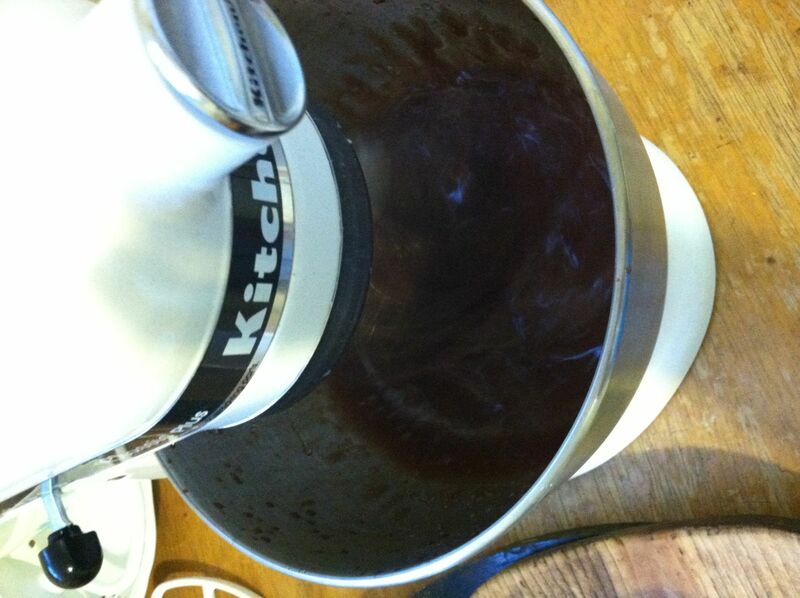 When the syrup reaches 245-250 F, slowly and carefully pour it into the running stand mixer with the chocolate syrup. Increase the speed to medium (#5 or 6) and whip for 5 minutes. Increase to med-high speed (#8) for another 5 minutes. Increase to high speed (#10) and beat for another 3-5 minutes or until the mallow holds a soft shape when you stop the mixer and pull up the whisk. The finished marshmallow will have tripled in volume. 6. Pour into prepared pan and smooth with an offset spatula or knife. Sift a thick layer of sugar coating over the top and leave in a cool dry place, like a counter, uncovered for at least 6 hours. 7. When set, use a butter knife to loosen the edges of the marshmallow from the pan. Sift a thick layer of sugar coating over a piece of parchment paper and carefully flip the marshmallow onto coating covered parchment. 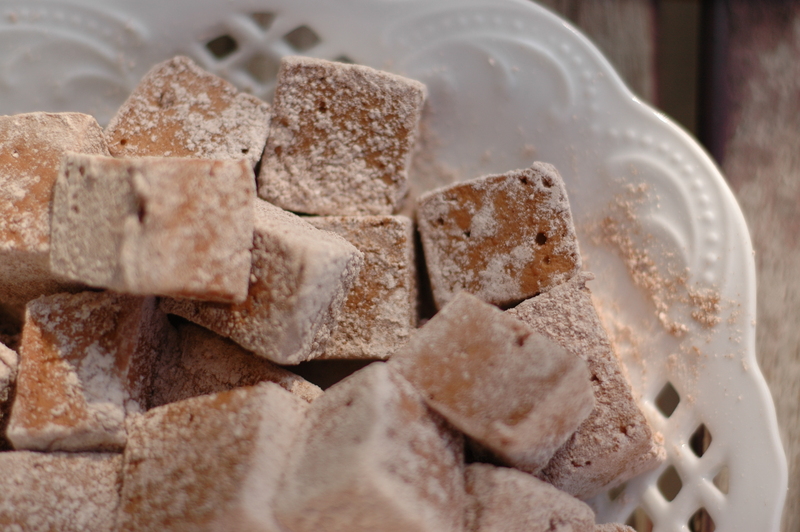 Using a large knife, cut the marshmallows into squares and coat all sides with more sugar coating. 8. Store in a single layer in a covered container with the lid vented to avoid building moisture. Dust on more coating if it gets absorbed. 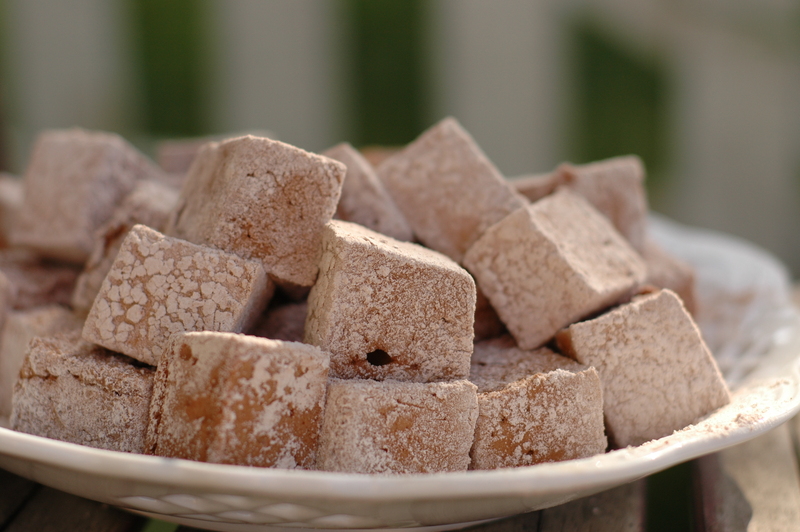 i didn’t even know one could make marshmallows from scratch. while i am not much of a baker and am also a bit disaster prone i am totally going to try making these!! thanks for the post!